A brilliant continuation of the story line that started in the previous book of this series: Extreme Measures. The story left of with al Qaeda terrorists devastating Washington DC with a series of explosions and then directly attacking the Counterterrorism Center itself killing 185 people. Mitch Rapp and Mike Nash were the heroes of the day stopping the attack and literally saving the lives of thousands including a congressional delegation. Three terrorist leaders are still at large. Unfortunately the slow and methodical way that the FBI is handling the investigation will probably lead to their escape. 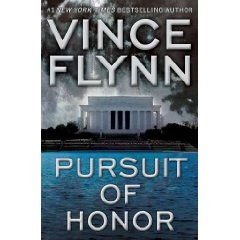 The President appoints Mitch Rapp to find and eliminate the final three. Rapp not only has to worry about finding the terrorists but also a Congressional investigation that is targeting him for brutally killing the terrorists who attacked the Center. Rapp battles it out with several Washington bureaucrats before he can go after the terrorists. Fortunately the terrorists have their own trouble and fight among themselves. Finally Mitch is able to get out of trouble and take down the al Qaeda guys. Another fast and furiously fun read by Vince Flynn.